My daughter loves sushi so she asked if she could be a California roll for Halloween. I wasn't sure how to do but got creative. I bought a foam pad and fabric and got to work. I cut the foam half and used hot glue to connect the two and make a roll. I closed the ends with cardboard circles then began to add the details. It was quite simple to do just a little time consuming. I also made a headband with a ginger flower and a side of wasabi. She absolutely loved it! Total cost was about $10. 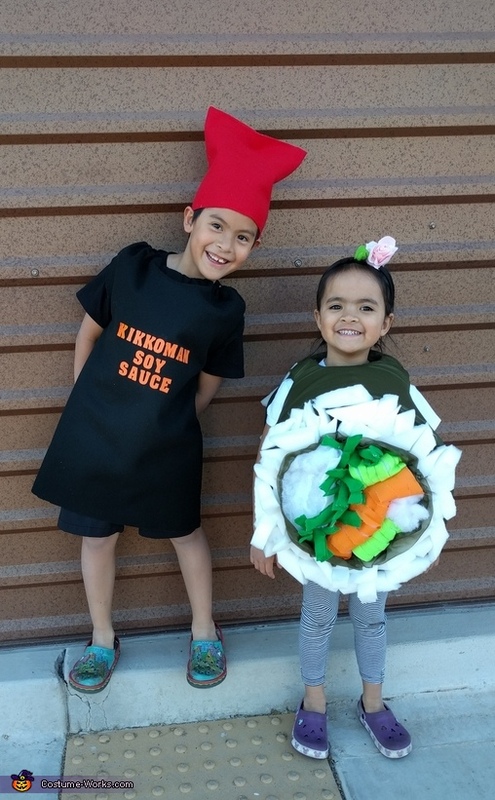 Since my daughter was a sushi roll my son just had to be soy sauce. This was absolutely easy and fun. I used black felt and hot glued the sides leaving room for his arms. I added foam letters and created a red hat to resemble the lid.